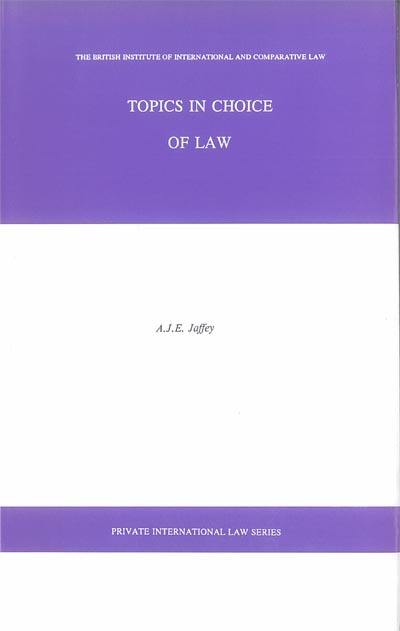 This book draws on articles which the author has published in various journals over the past twenty years and presents a distinctive and coherent theory of choice of law in the conflict of laws. It examines the objectives and criteria underlying choice of law rules, and the principles of justice which are germane to choice of law in the English conflict of laws. The original articles have been revised not only to ensure that the elements of the theory are clearly expounded, but also to accomodate important changes in the law. Thus, for example, the chapters on tort deal with the provisions of the recently enacted Private International Law (Miscellaneous Provisions) Act 1995. Similarly, the chapters on contract analyse the changes resulting from the implementation into English law of the Rome Convention of 19 June 1980 on the Law Applicable to Contractual Obligations. The book presents not only a theory but also considers its practical application. For example, in cases of contract and tort the court often has to select the appropriate governing law on the basis of a flexible applicable law. In the relevant chapters the book suggests what criteria should be used in applying statutory formulae and, where appropriate, specific guidelines. The topics discussed in detail are contract - the governing law, the essential validity of contracts, the formation of contracts, choice of law by arbitrators of international contracts, torts (single and multi-State), and the essential validity of marriage. "Topics in Choice of Law"